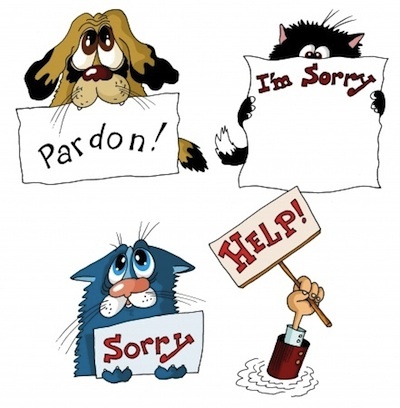 Sorry seems to be the hardest word, as Elton John reminds us, but that’s not always the case. Sometimes sorry is the easiest word, the one we use to get us off the hook, to make us look good, to prevent further discussion. We use the same word when our actions have caused serious hurt or damage. The word is both overused and underused, with the result that sometimes just saying sorry isn’t enough. An apology is an expression of regret or remorse for something we have done. It is usually expected to be be accompanied by an intention or offer to put things right. For an apology to be authentic, both the regret and the desire to make amends have to be in place, otherwise it’s just a meaningless form of words. Even worse, it can become all about you. We’ve all come across the ‘look-at-me-aren’t I magnanimous’ apology, usually delivered with an eye to a wider audience. Often, this apology takes the form of ‘I am so sorry’ said with equal emphasis on every word. This form of delivery somehow turns the spotlight on the person apologising and makes the apology a performance. Or there’s the throwaway ‘sorree’ that’s meant to make everything hunky dory. Or the ‘I’ve said I’m sorry, what more do you want?’ which is designed to put the apologiser in the right and you in the wrong. It’s not an apology when you don’t take responsibility for your actions and their effect. Saying that you are sorry that someone feels hurt or offended or let down is not the same as acknowledging your role in the situation. In fact, by saying you are sorry for how they feel you are implicitly criticising them for their response. ‘I’m sorry I didn’t consider your feelings’ acknowledges your responsibility. ‘I’m sorry you felt embarrassed’ doesn’t. Don’t apologise for your feelings. They may be selfish, unworthy, irrational, mean, small-minded, ungenerous – but they’re yours. Live with them or work on them. It’s your decision. Don’t apologise for something that isn’t your fault. You can commiserate without using the words ‘I’m sorry’. You can say something like ‘It’s a shame that’ or ‘I understand how inconvenient/upsetting/difficult this is’. Decide how you will deliver your message. You can choose to write it or to speak it. Either way, it needn’t be long. Sincere and to the point is the way to go. If you write, in an email or a letter, you can work at getting exactly the right words and tone. (A text message may be a little casual for a formal apology, but it’s up to you.) You are sending something that can be a permanent record, so it’s a good idea to get it right. As with any tricky communication, once you have composed your final version, set it aside for a short time and have a final look before sending it. Phone apologies are OK, but can be tricky. If you choose this medium, check before you begin that this is a good time to talk. Stand up when you speak. Use the same facial expressions and tone of voice as you would if the person was in front of you. On no account let them hear the sound of fingers on keyboard as you check your emails at the same time. On no account break off mid-sentence to speak to a colleague, child, ticket collector on the train, waiter… But you wouldn’t dream of doing that, would you? If you speak in person, choose a good time and place. You need to have the person’s attention and know that you are being heard. Unless you want it to develop into a discussion, be ready to move away once you have said your piece. Keep your body and your limbs turned towards the person. Maintain eye contact. Don’t smile nervously. Keep your voice level. Don’t dilute the impact of your apology by giving an excuse or blaming external people or factors. ‘I’m sorry the delivery was late, but you just can’t trust those couriers’ or ‘To be fair, it wasn’t all down to me’ are not worthwhile apologies. If other people were involved, leave them out of it and take responsibility for your contribution. You might want to show your desire to make up for what you have done. If you are offering to do something to make amends, make sure that your offer is suitable, that you can follow through and that it is what the person wants. There is no point saying you will pay for something you lost or broke if it is irreplaceable. There is no point in saying something will never happen again if there is every possibility it might happen again. Little, thoughtful actions can sometimes show the wish to make amends as effectively as words. Providing a particularly scrumptious goody to share with your coffee, getting a ticket for something you know they’d enjoy, helping with something in an unexpected way are some ways of showing that you regret what you did and want to re-establish good relationships. Your apology may be gracefully received, or it may not. Don’t go off in a huff if you don’t get the response you want. It’s not about you. You were wonderful in Love Story. You were the poster girl for the clear-skinned, glossy-haired preppy look (remember that scarf?) that has never quite gone away. But how we wish you had never said love means never having to say you’re sorry. Because we actually do have to say we’re sorry. Often. If you want to hear it said beautifully, listen to Billy Eckstine singing I Apologise. His voice is warm and golden as he says ‘If I caused you pain, I know I’m to blame.’ How could you not forgive him? And check out Brenda Lee’s I’m Sorry. Her powerful tones crack with emotion as she begs ‘Please accept my apology.’ Of course, you’re forgiven, Brenda, as we all hope we will be.